Sailor Beware needs little, if any, introduction. 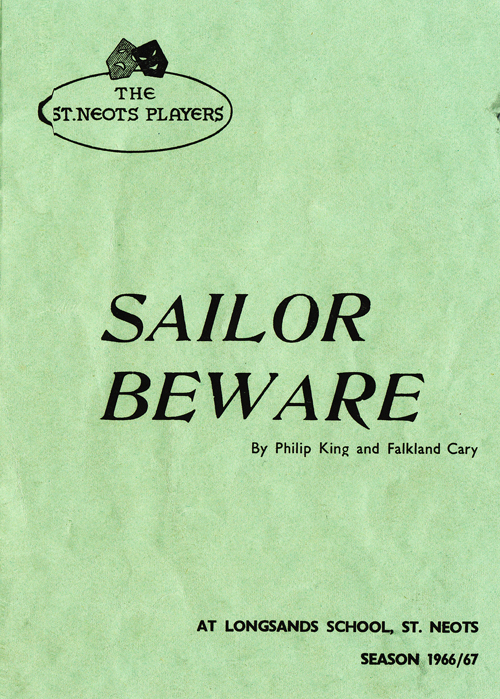 The product of two well know comedy writers, Philip King and Falkland Cary, and the first of three plays about the Hornetts the others being “Watch it Sailor” and “Rock a bye Sailor” it first opened in the West End at the Strand Theatre on February 16th, 1955 exactly twelves years and one month before this St Neots Players version. The Play begins as the Hornett family are preparing for the wedding of daughter Shirley to a sailor, Albert Tufnell AB who is due to arrive any moment with his best man. With husband, Henry, being smart and keeping out of the way with his ferrest, sister-in-law Edie remembering her great sorrow of twenty years ago when she was left at the alter and next door neighbour, Florrie, popped in and out for a gossip; it is little wonder that Emma Hornett is working up a fine head of steam that will be let off at those around her and at the visitors to the household, headed by niece Daphne and rounded off by the Vicar. With the first ring of the doorbell the play swings into action – like a title fight from the time-keeper’s gong.